This is an exotic smoked chicken using tea leaves as the smoking mixture. If you want to cook a roasted chicken but you want to taste something unique and special, I think you should try tea smoked chicken. Although this is a Chinese cuisine, most of the ingredients are easy to find in your local supermarket except the Szechwan peppercorns. This spice can only be bought in Chinese drugstores or Chinese grocery store that sell spices. Szechwan peppercorn is not a real peppercorn but is the fruit of a citrus tree. You also need to toast the peppercorns on a dry skillet and removing the black seed before crushing the flower-like berries. On only cooking utensil that you need is a stainless steel pot lined with aluminum foil. The reason why you need to use aluminum foil is because the smoking mixture will leave a nasty burnt residue on the stainless steel pot. It will be very hard to clean it afterwards. You will just throw away the aluminum foil lining after cooking the chicken. Another convenient way is using a cheap stainless steel plate over the a burner covered with a pot and a circular rack for holding the chicken above the smoking mixture. This style of low temperature cooking helps the chicken stay moist and the aroma of the seasoning and smoking will give a great Chinese style tea smoked chicken. 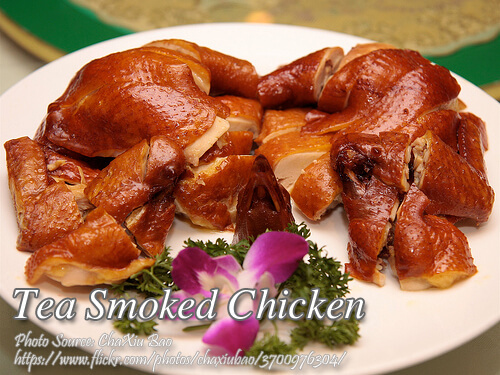 This is an exotic smoked chicken using tea leaves as the smoking mixture. If you want to cook a roasted chicken but you want to taste something unique and special, I think you should try tea smoked chicken. Wash the chicken and pat dry inside and out with paper towels. Lay the chicken on a flat surface and press down to break the breast bone. Reach in from the rear and remove the breast bone by working your fingers between the bone and the meat and pulling it out. Combine Szechuan peppercorns, salt and five spice powder in a small bowl. Rub the seasoning inside the cavity and outside the chicken. Refrigerate about 8 hours or overnight. To prepare the smoking mixture, combine tea leaves, sugar, rice, ginger, orange zest and cinnamon. Then prepare the smoking pot by lining the inside of stainless steel pot with aluminum foil. Put the smoking mixture inside the pot. Place chicken on a rack and place the rack on top of the smoking mixture inside the pot. Put the pot on top of a burner set to a medium flame and smoke the chicken until the thigh juices run clear or you can also use a thermometer and cook it on a 160°F heat. Once it becomes golden brown, remove from the pot and brush with sesame oil and cool for about 10 minutes before cutting and serving.